When he was just a little boy, my now-husband would sing for his family, gathering them together to hear various verses of Peace is Flowing Like a River. And sometimes, while we are in the grocery store or doing household chores or getting ready for work, I can hear him humming or whistling the tune. But it isn’t just him who gets the song stuck in his head. I do, too, after having traveled to Lourdes this past January. I don’t think I started humming the song when we were there… it’s just now that I look back on pictures of the grotto and the spring and the clear water flowing that the words become evident. 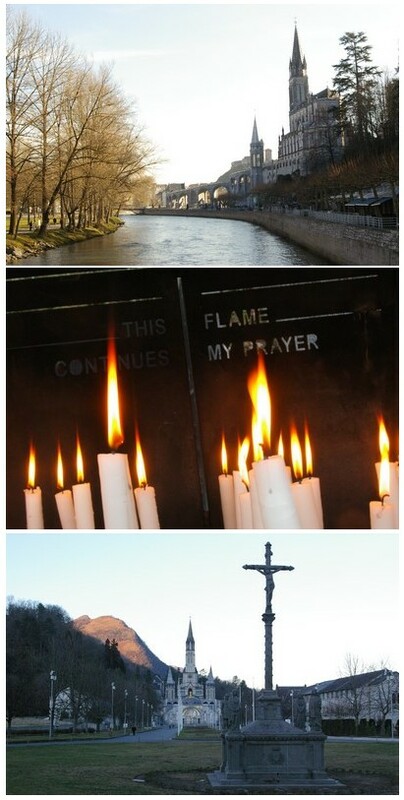 Peace – it is everywhere in Lourdes and it flows in and around and through you, and in that peace lies healing power. Our Holy Father, Pope Benedict XVI, will be making his first pontifical visit to Lourdes on September 13 and 14 (and Salt + Light will be bringing those events to you), where, 150 years ago, the Blessed Virgin appeared to fourteen-year-old Bernadette Soubiroux. Now as one of the most popular pilgrimage sites in Christendom, hundreds of thousands of pilgrims journey to Lourdes each year to seek healing in the water that springs forth from the place where Bernadette stood before the Virgin Mary. By God’s design and not our own, David and I were among the number of pilgrims in the year of the 150th Jubilee. It wasn’t a pilgrimage we planned for years or even months, but simply a stop on a trip from one place to another. 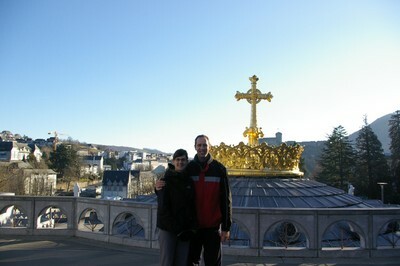 But those 24 hours in Lourdes have resulted in many more days of thinking and seeking the feelings we experienced there. Like many pilgrims, we attended Mass, we offered up the prayers we carried in our hearts, we walked around the Grotto, we witnessed the streams of people collecting water and lighting candles, and, for a while, we just sat with a view of the water and the Basilica in front of us. There was such peace in all these moments – we were not rushed or pushed; we did not feel hurried; we could just sit with the sun on our faces and feast our eyes on a physical sign of faith. Peace flowed, life flowed, love flowed. How can this be? How can this peace exist in this one place? Where does it come from? Particularly for people with an agenda – with a determined number of things to do and see in a particular amount of time – how can we be content to just sit and be still? For us, the answer is not fully awakened yet. We understand that we were blessed to be in this place. We understand that we were given a unique opportunity to pray before an important sign of faith. We understand that there are things that can be explained and things that cannot. But we are still seeking, as we sing, to understand this peace that flows through us like a river.